Round 5 games of Alekhine Memorial were played in Paris on April 25. The French part of the tournament is thus over. 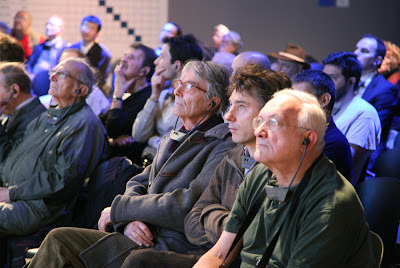 Participants moved to Saint-Petersburg on April 26. Three games out of five were effective in Round 5. World Champion Viswanathan Anand scored his first point with white against Chinese Grandmaster Ding Liren. This victory allowed Anand to finish this part of the tournament with 50% points. A true sensation happened in a game between Kramnik and Fressinet. The French Grandmaster, who is a rating outsider of the tournament, totally defeated former World Chess Champion who was playing white. Maxime Vachier-Lagrave was the author of the third victory, who successfully outplayed Peter Svidler who had white pieces. 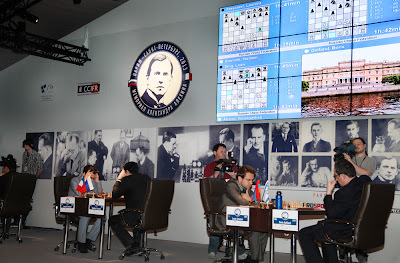 This part of the tournament, which was played in France, brought a French leader to the joy of spectators who made the playing hall totally overcrowded every round. The second part of the tournament will show whether Vachier-Lagrave is capable to remain on the top position up to the end. 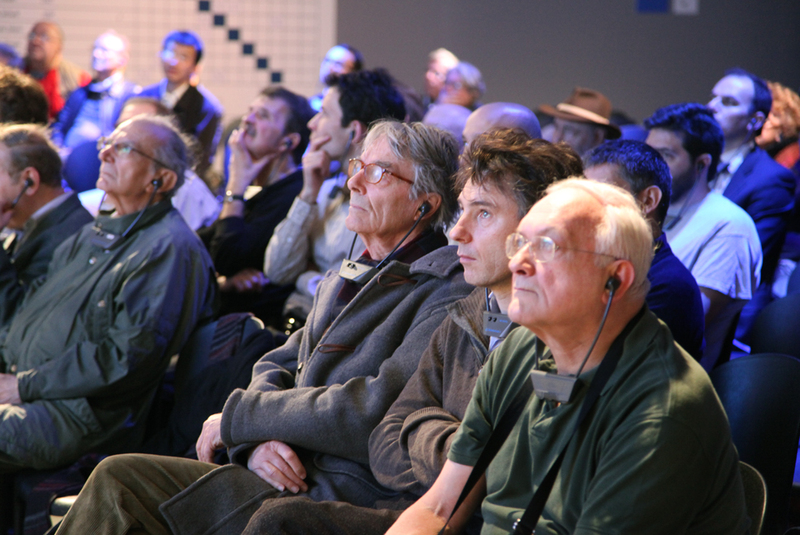 However, experts acknowledge a big amount of effective games (11 out of 25) and a huge interested for the tournament showed by chess fans. The official tournament site, where users can watch games that are commented in three languages, was visited by more than 200 000 users. 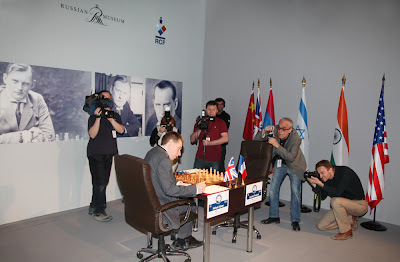 Paris part of Alekhine Memorial was a wonderful event and everyone is now looking forward to see Saint-Petersburg part. The winner of Alekhine Memorial will be announced on the 1st of May. Standings after five rounds. 1. Vachier-Lagrave – 3,5 points; 2-5. Adams, Aronian, Fressinet, Gelfand – по 3 points; 6. Anand – 2,5 points; 7-9. Kramnik, Vitiugov, Ding Liren – 2 points; 10. Svidler – 1 point. Round 5 results: Svidler – Vachier-Lagrave 0-1, Kramnik – Fressinet 0-1, Anand – Ding Liren 1-0, Gelfand – Aronian, Adams – Vitiugov both drawn. Round 6 pairings: Vachier-Lagrave – Gelfand, Aronian – Adams, Fressinet – Vitiugov, Kramnik – Anand, Ding Liren – Svidler. 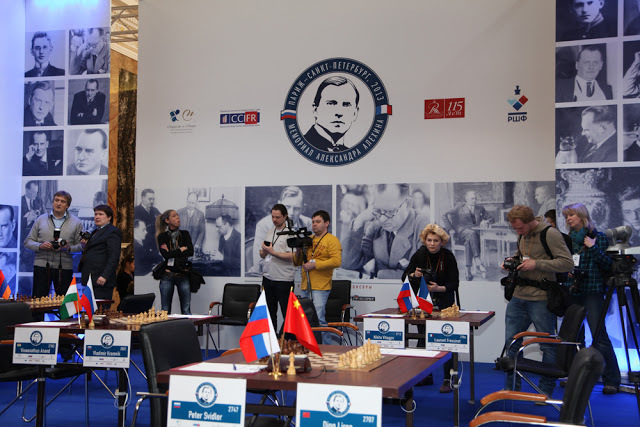 Round 4 games of Alekhine Memorial were played in Paris on April 24. Like in Round 3 four games out of five ended in a draw. The key game of the round was played between Levon Aronian and Peter Svidler. It was hard to predict however that this would be the only effective game of the round. Yet, Aronian’s fighting mood was clearly seen. 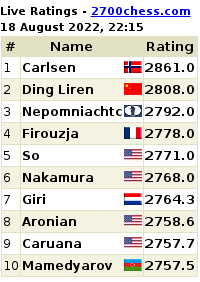 It seems that he tries to catch up what he missed when he played in Candidates Tournament in London. Aronian performed a deep home preparation against Svidler’s hallmark in Grunfeld defense. Russian grandmaster, World Cup winner, couldn’t solve his opening problems and got a bad endgame, where Aronian gained a strategic advantage. Before the first time control was reached the game was consistently won for white. 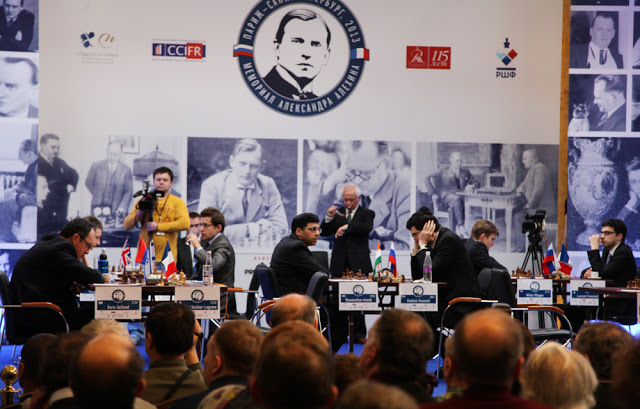 As all other games ended in a draw Levon Aronian joined the tournament leaders – Gelfand, Adams and Vachier-Lagrave. Boris Gelfand, who was playing black, met some minor opening problems that were created by Nikita Vitiugov, but managed to avoid all the threats and drew the game. French grandmaster Maxime Vachier-Lagrave played white against World champion Viswanathan Anand. He got a slight advantage, but before the first time control Maxime made a mistake and his opponent capitalized on opponent’s error and drew the game as well. 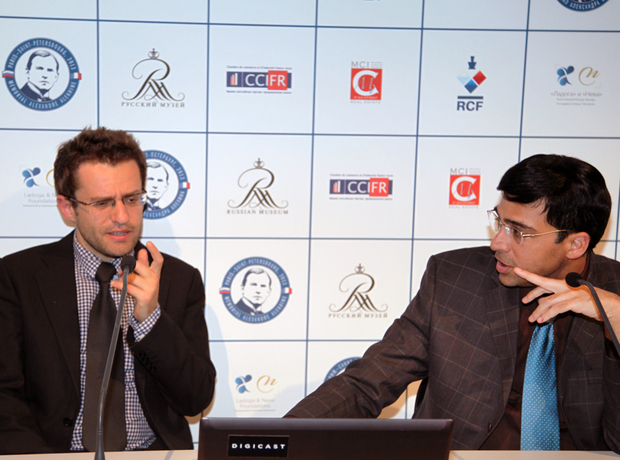 At the press conference after the game Vachier-Lagrave mentioned that the position on the board still remained equal. The game between Chinese prodigy Ding Liren and former World champion Vladimir Kramnik ended earlier than others. Kramnik showed a precise way to equality. The game between Laurent Fressinet and Michael Adams looked much more dramatic. French grandmaster tried to change the tournament leader, however Adams performed an obstinate defense and saved himself half a point that still keeps him in the leading group of the tournament. Places after four rounds: 1-4. Adams, Vachier-Lagrave, Gelfand, Aronian – 2.5 points; 5-7. Kramnik, Ding Liren, Fressinet – 2 points; 8-9, Vitiugov, Anand – 1.5 points, 10. Svidler – 1 point. Round 5 pairings: Gelfand – Aronian, Adams – Vitiugov, Svidler – Vachier-Lagrave, Kramnik – Fressinet, Anand – Ding Liren. Round 3 games of the Alekhine Chess Memorial were played in Paris on April, 23. Four games out of five ended in a draw. The key game of the round was played between Boris Gelfand and Michael Adams. Adams was playing black. He started the tournament with two victories over Anand and Svidler. As for Gelfand – it was his first game in the tournament played with white pieces. 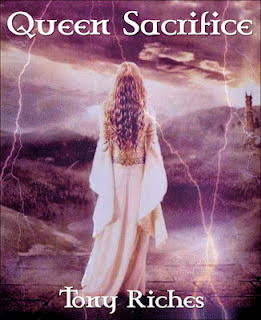 The most significant duel of the round lasted longer than others and continued for approximately seven hours. 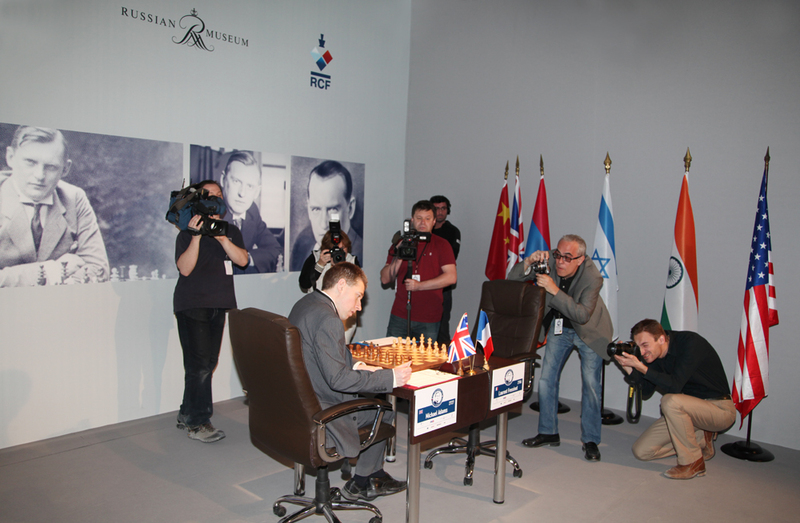 After the game Gelfand said he used the opening scheme that was played by Alekhine himself. 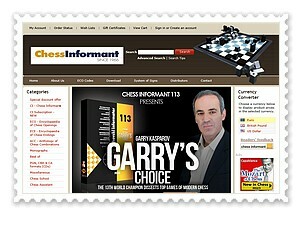 The Grandmaster from Israel grabbed the initiative and systematically increased his advantage. In the endgame, Gelfand won a pawn and gradually forced his opponent to resign. Having won his first game in the event so far, Boris Gelfand joined the tournament leader. Another French Grandmaster Laurent Fressinet faced young Chinese prodigy Grandmaster Ding Liren. The game turned out to be a sharp one. Black had an initiative but white found a way to save the game and it ended in a draw. Anand– Aronian game showed that the World Champion couldn’t use the advantage of his white pieces and had to pass to an equal endgame. This game ended first. Soon after that a draw was concluded by two players from Saint-Petersburg – Peter Svidler and Nikita Vitiugov. Their game finished with a perpetual check. Round3 results: Gelfand – Adams 1-0, Kramnik – Vachier-Lagrave, Ding Liren – Fressinet, Anand – Aronian, Svidler –Vitiugov (all four games ended in a draw). 8-10. Svidler, Vitiugov, Anand – 1 point. Round 4 pairings: Watch Live 5.30 pm onwardsVachier-Lagrave– Anand, Vitiugov – Gelfand, Fressinet – Adams,Ding Liren – Kramnik, Aronian – Svidler.